That’s strange. The old Star Wars toys I’ve customized with Sharpies and finger paint and put on Ebay haven’t been selling that well. 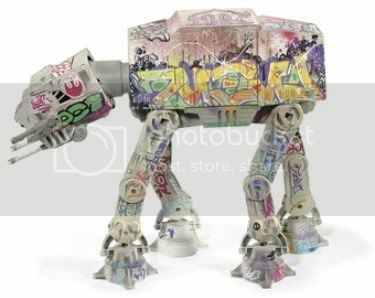 Yet ChooseChris found this graffiti-covered version of a classic AT-AT toy from Hasbro that sold for a whopping $1,250 in auction at Christie’s. Customized Hasbro Star Wars vehicle customized by professional Graffiti artists EASE and JK5 under the direction of SUCKADELIC. All tags are written in the Aurebesh language, a fictional letter system created for the in-world use for the 6 Star Wars films. The largest tag on the side of the vehicle spells the word REBEL. Ok, what exactly does it take to become a “professional Graffiti artist”? ‘Cause I was quite the artistic vandal in my younger years, and I’d be glad to create some one-of-a-kind pieces in the toilet paper and eggs mediums. Contact my agent with your home address and I’ll line up something special for you.